With the Internet of Things (IoT) becoming all the rage, an increasing number of smart home hubs are being released onto the market. The Korean tech giant LG has decided it’s time to increase the number further with its own SmartThinQ Hub set to be unveiled at CES 2016. Just like its peers, the LG SmartThinQ hub will facilitate communication between smart devices in your home. If you have seen the Amazon Echo, you are likely to see in the LG SmartThinQ Hub an imitation, although this one offers more. It parades a cylindrical shape somewhat similar to the Amazon smart speaker. The hub looks attractive and comes in champagne gold and black colour options. It packs a 3.5-inch colour LCD display that lets you monitor what is being done by the connected devices in the home. LG provides a large high-quality speaker in the unit. LG SmartThinQ Hub, which runs on the open source AllJoyn Alliance platform, is made to serve mainly as a ‘gateway’ to smart devices and sensors, according to its manufacturer. In addition to working with smart appliances, it can also work with traditional devices or appliances connected to SmartThinQ sensors via Bluetooth, Wi-Fi or ZigBee. You can easily monitor and control home appliances such as robotic vacuum cleaners, refrigerators and air conditioners as well as a variety of other sensors with this hub. 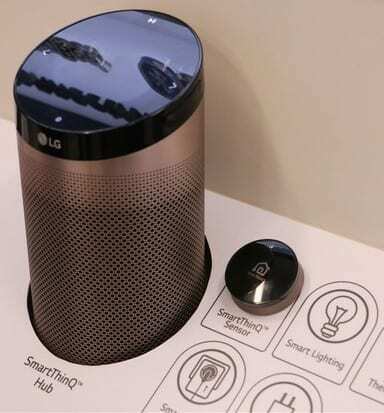 One aspect where LG SmartThinQ Hub may be mostly considered an imitation of the Amazon Echo is its ability to stream music via its integrated, powerful speaker. You will be able to stream music from free radio stations or from the personal collection on your phone or tablet. The inbuilt speaker can also be used to read out notifications as they are received. Notifications and controls will be managed using a special SmartThinQ app. The hub can also display reminders from your personal calendar. LG SmartThinQ Hub will apparently be compatible with SmartThinQ products, which are considered among the pioneer smart home devices. It will also be able to work with appliances from other manufacturers running on the AllJoyn platform. The hub will work with conventional appliances connected to the SmartThinQ Sensor announced a few months ago. It is expected to be compatible with the Nest Learning Thermostat and IFTTT, the online automation service, amongst others.